Seniors sport letter winners from around New Ulm were be honored Saturday, April 7 at the Martin Luther College at 6:30 pm. The banquet is put on annually by the New Ulm Club for an appreciation of the senior athletes. 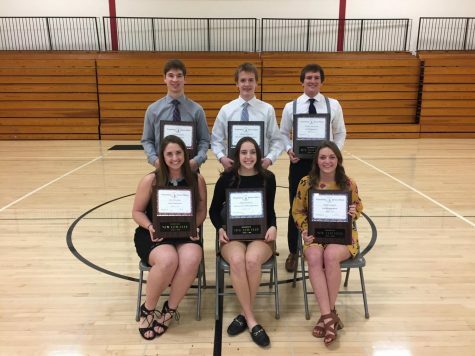 Seniors from New Ulm Public, New Ulm Cathedral, and Minnesota Valley Luther high schools were invited to attend the banquet to be recognized as athletes. 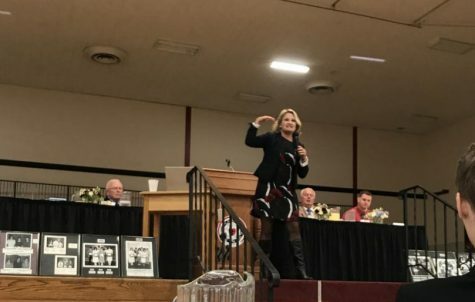 The banquet began in 1955, making this the 64th annual hosting of the event by the New Ulm Club. The New Ulm Club only honored one male athlete from each school until 1976, and since then has been honoring both male and female athletes. The banquet started by announcing all of the athletes in each school. The banquet continued with words from a guest speaker and the naming of the Outstanding Senior Athletes from each school. CINDRA KAMPHOFF speaks about the importance of mindset. Winners from Cathedral (sitting on the far right) are Nathan Hauser and Rose Hazuka. Nathan has lettered eight times – twice in football, three times in basketball and baseball. Rose has nine letters, three in Volleyball, basketball, and softball. Winners from MVL (pictured in the middle) are Jakin Anderson and Haley Birkholz. Jakin has lettered four times: twice in basketball, once in golf and cross country. Haley has lettered six times: three in volleyball and three in basketball. New Ulm Eagle winners are Hunter Ranweiler and Sarah Longtin. Hunter has lettered twelve times, and Sarah has lettered ten times. Hunter has had an impressive high school sports career participating in three sports all four years of high school. Hunter is an all-conference athlete in football, wrestling twice, and baseball twice. In football, Hunter has transitioned from running back to quarter back this year and broke the single season school passing record with 18 touchdown passes and has earned four letters. He says that he regrets not switching earlier, even though at times it was really tough for him. In wrestling, Hunter has earned his spot in the state tournament twice, finishing fifth as a junior, and has been a two-time section champ earning five letters. Hunter started getting into baseball before any other sport, saying, “I have been around baseball since I was born. I was at the ballpark all the time because my dad was playing baseball.” Hunter has been starting catcher for the eagles for three years. He has a .382 batting average and 32 stolen bases, earning him three letters for baseball. Hunter says that he has lots of passion for baseball and it has become his favorite sport when he “started paying attention to the MLB and saw younger players becoming stars” and he always wanted to be that guy. Next year Hunter will continue his education and baseball career at Minnesota State University-Mankato. Sarah is a two-sport athlete, participating in volleyball and gymnastics during her senior year. In volleyball Sarah has received All-Conference her junior year. Sarah is the libero for the eagles. During her gymnastics career Sarah has been a state participant in balance beam during her junior year and has been All-Conference twice. Sarah competed in all four events in gymnastics. Her all around average was 34.1 and her high was 34.975. She says that she has done gymanstics since she was about 3 or 4 years old, saying that it is her favorite because “it’s something you can always be improving yourself in” and she likes the small team that you can get close with. Sarah ran track on varsity for four years, competing in the triple-jump, 4×1, pole vault, and hurdles. Next year Sarah will also continue her education at Minnesota State University-Mankato.